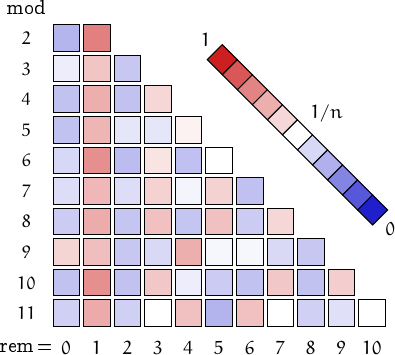 A number is panconsummate if for every base , there is a number such that divided by its sum of digits in base gives . In other words, a number is panconsummate it is not inconsummate in any base. Checking for this property is made easier by noting that a number is always "consummate" in a base . For example, 5 is panconsummate because (a) and , (b) and , and (c) and . On the contrary, 62 is not panconsummate because in base 10 it does not exist a number such that = 62 (i.e., 62 is inconsummate). The known panconsummate numbers are 1, 2, 3, 4, 5, 6, 7, 8, 9, 10, 11, 12, 14, 15, 18, 20, 21, 23, 24, 31, 34, 36, 37, 39, 40, 43, 45, 53, 54, 57, 59, 61, 69, 72, 73, 77, 78, 81, 85, 89, 91, 121, 127, 144, 166, 169, 211, 219, 231, 239, 257, 267, 271, 331, 337, 353, 361, 413, 481, 523, 571, 661, 721, 1093, 1291, 3097. It there exist a further such number (which seems improbable), it must be greater than . 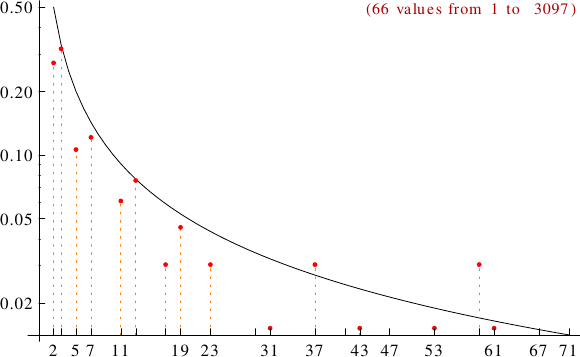 A graph displaying how many panconsummate numbers are multiples of the primes p from 2 to 71. In black the ideal line 1/p.